**Spoiler Alert! Secrets revealed on how to perform this magical transformation!! Just because your bathroom is small doesn't mean that it has to be boring. With a bit of slight-o'-hand and lighting, you can transform your small bath into this cozy retreat showing off your sense of taste and style. To enhance the illusion, the use of small, diagonal tiles on the floor lead the eye away and give a spacious impression. Using white grout with the white tiles eliminates the visual grout lines thus reducing the cluttered, overdone look. This is a perfect special effect for a smaller bathroom. I love the choice here to stick with the traditional dÃ©cor as, in truth, no amount of redecorating will make the room larger. All we can hope to accomplish is to make the bathroom appear larger. 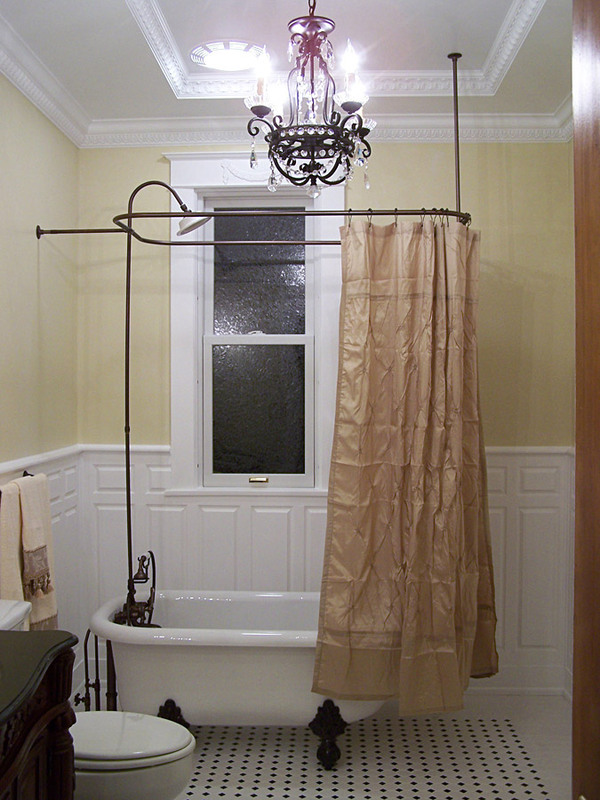 For instance, the short ball and claw footed bathtub becomes the focal point of this room. By using a stand-up, shower friendly design and off-centering the tub along the wall, it gives the impression that there is extra, unused space. By using the 62 shower riser and curtain enclosure to add height, we have the bath in the bathroom covered. Viola! Especially in some older bathrooms, one of the greatest challenges in your remodel will be giving height to the ceiling. Since, in most cases, a structural overhaul is both a difficult feat of engineering as well as financially prohibitive, you can create the illusion of a raised ceiling by creating a tray vault up into the existing attic or crawl space above the bathroom and trimming it with one of our polyurethane moldings. This wizard of the water closet chose to use two different styles of moldings for this act of bathroom bewitchment. Both have a nice 45Âº angled profile giving rise to the ceiling. 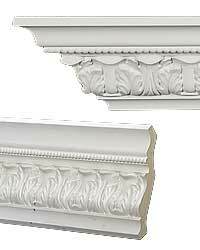 The crown used on the walls here is our CM-1124 crown molding. Leaving the molding white breaks up the color between the walls and ceiling adding contrast and height. 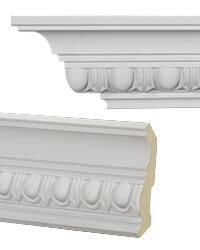 By using our ET-88260 crown molding, we only have to raise the tray vault a matter of a few inches thus eliminating the need for a major rafter relocation (consult a structural engineer or general contractor before relocating any rafters on your own). Notice that the ceiling of the tray vault is painted white. The lighter tones add to the visual deception of height as the lighter tone reflects the light creating shadows. Add charm and visual appeal to any room in your house with wainscot. Wainscoting instantly adds character, style and a sense of history to a home. Use our WR-9139 to enhance the architectural decor of your bathroom. Trim the window with our large BB-9789 window trim. Accent the border with one of our bow and tassel combos (as shown here painted white).